PAN is an alphanumeric 10 digit number which is used in all communication to income tax department. As per the provisions of income tax act, one tax payer can not possess more than one PAN. This does not mean that you can not apply for a PAN card if it’s lost. What we are talking about is one individual or company or firm can not possess more than one number. One number should be allotted to one individual or company or firm. A woman before marriage has applied for PAN and dully allotted by income tax department. After marriage her name got changed and instead of changing the name in pan card she has applied for another permanent account number and allotted by IT department. In this kind of situations such woman need to surrender the first PAN to IT department otherwise penalty will be imposed. There can be instances where after applying for a Permanent Account Number, IT department has not allotted it to the person. And such person has applied once again to get a PAN card. As a result of such applications the applicant has ended up with more than one Permanent Account Number. In some cases false PANs are obtained to open benami demat account and these accounts are then used to transact in IPO scam and other buying and selling of shares. 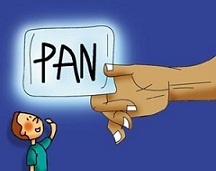 Under income tax act, one person can not apply for another PAN if, one has already been allotted to him. Failure to meet such conditions will attract a penalty of Rs. 10000. In case of having such extra pan card, the applicant need to visit to income tax ward related to him and surrender the extra PAN that he has obtained. You can use the facility of change or correction of pan card form available online or in TIN FC to surrender the additional PAN which is not in use. In the change or correction form you have an option “Mention other Permanent Account Numbers inadvertently allotted to you” to mention your PAN. One can enter the Permanent Account Number that is by inadvertently allotted and surrender such card to the IT department. One can also use the online facility available by income tax department to surrender the fake or duplicate PAN. This facility is available only to surrender a duplicate PAN. Use this link and fill up the details to surrender the fake PAN.